Ubuntu Touch has been available for quite some time now. Canonical, the developers behind Ubuntu, have partnered with a number of manufacturers to show off the software on their devices. It seems like Chinese manufacturer Meizu will be the latest to join the list of companies to support Ubuntu. 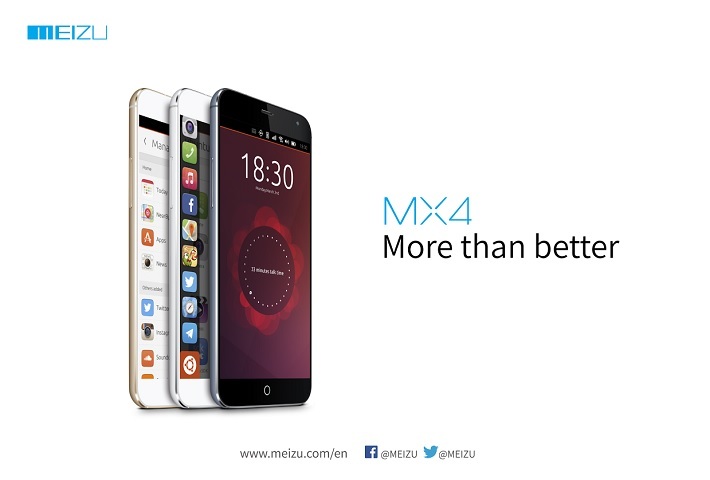 The company will reportedly show off the software on the MX4 flagship which was announced in September last year. The two companies have been believed to be working on the software for a long time now, so it was only a matter of time before Meizu unveiled hardware running on Ubuntu. It’s not clear yet if the Ubuntu Edition MX4 will be available for purchase on a global scale, but considering the popularity of the smartphone in the Asian markets, we’re hoping they will be available for sale subsequently. The Android version of the MX4 is currently available online for roughly around $350, so we can expect a similar price tag for the Ubuntu version as well. The Meizu MX4 packs a 5.36 inch 1080p display, 20.7-megapixel camera on the back, 2GB of RAM, 16/32/64GB of internal storage, an octa core MediaTek MT6595 chipset and a 3,100 mAh battery.